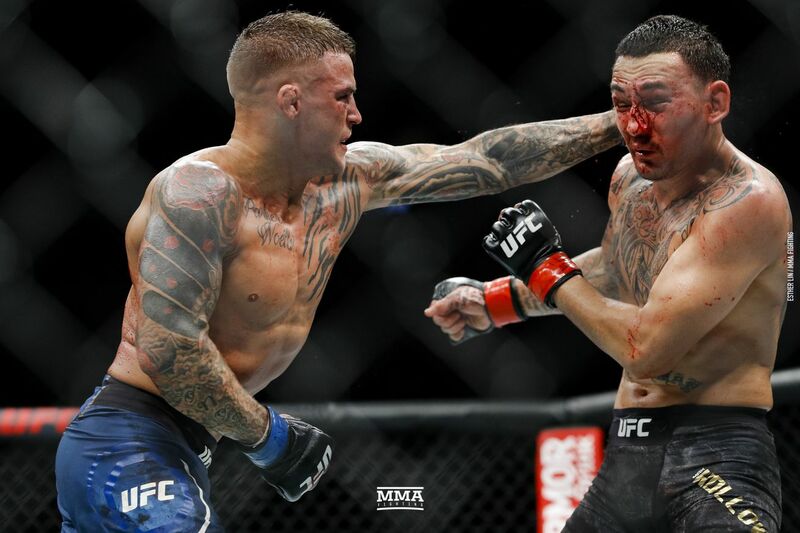 DUSTIN POIRIER - Poirier (25-5, 1 no contest) has now run up a streak of six straight classic brawls. The Holloway win comes on the heels of two bouts with Eddie Alvarez, and one each with Justin Gaethje, Anthony Pettis and Jim Miller. In that run of name opponents, Poirier has five wins and a no-contest. MAX HOLLOWAY - Holloway (20-4) had dominated the featherweight division. Poirier, his opponent, was also a featherweight who had great success moving up to lightweight. The difference is Poirier packed a lot of muscular size on his body, while Holloway, even though he cut heavily to make featherweight, physically still looked more like a featherweight in the cage. ISRAEL ADESANYA - At 17-0, the Style Bender has one of the most impressive records in the sport among those who have fought at the top level. Gastelum showed Adesanya is far from unbeatable. But he also showed Adesanya is also far from a front runner, in the sense when the fight was on the line going into the fifth round, it was Adesanya who shined. KELVIN GASTELUM - Although Gastelum (15-4, 1 no contest) lost on Saturday, that fight was the textbook example of a fight where, to the public, there was no loser. Yes, Gastelum is hurt because with a win, he’d be the one getting the shot at Whittaker. But at the same time, he made himself a fighter that the public has more interest in seeing again. NIKITA KRYLOV - Krylov (25-6) got a second-round submission over an exhausted Ovince Saint Preux (23-13) on Saturday. Krylov should be used next to determine if fighters on the rise have the goods to be in the light heavyweight title picture.